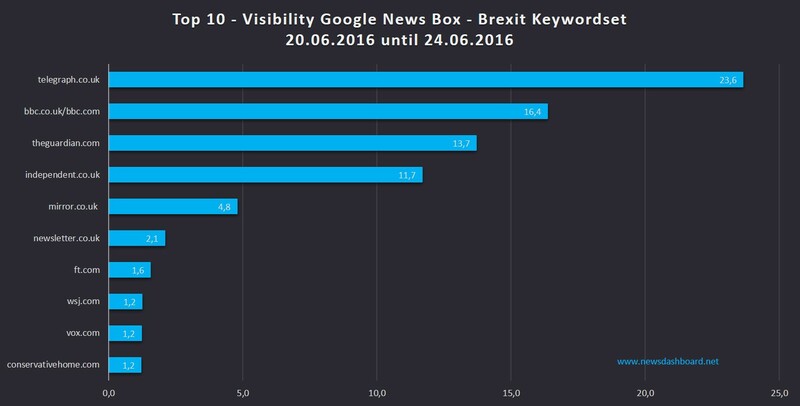 The Brexiteers won the EU referendum – which news publisher had the highest visibility in the Google News Boxes? The 23rd of June 2016 will go down in history. 51.9 percent in Britain voted to leave the European Union. The Brexiteers are jubilant, those, who wanted to remain in the EU are shocked. Politicians from Scotland and Northern Ireland already said that they would like to remain in the EU, even if they have to split away from England. The time will show which consequences this referendum has for UK and for the EU. 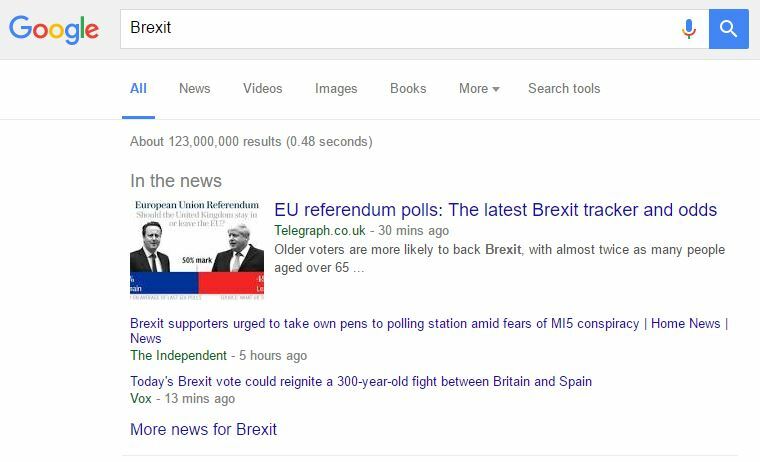 A screenshot of the Google News Box of the Keyword “Brexit” – 23rd June 2016. Now we will concentrate on the performances of the British news publishers in the Google News Boxes. We looked at a specific keywordset of 13 keywords regarding the EU referendum (you will find a list of the keywords below) and analysed different time intervals. First of all we will take a look at this week. 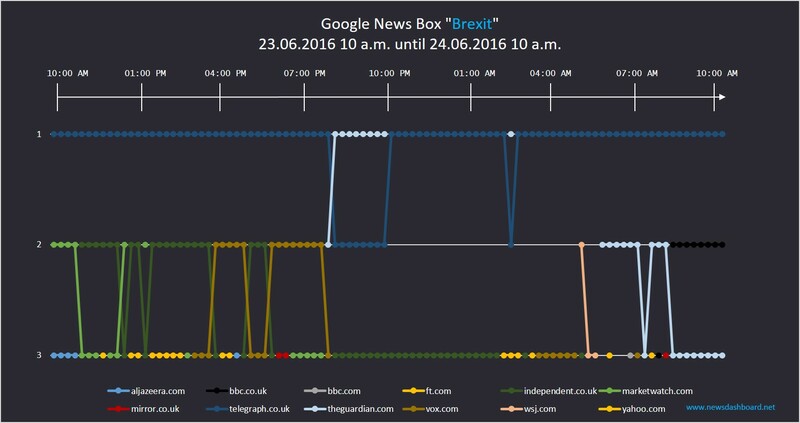 Which news publisher dominated the Google News Boxes between Monday, 20th of June and Friday, the day after the referendum? The Telegraph.co.uk had the highest visibility in the Google News Boxes. As you can see in the picture above, the Telegraph had the highest visibility in the Google News Boxes in the last few days before the referendum took place. In the run-up to the referendum the Telegraph seemed to sympathize with the Leave-Camp, so it interesting to see it clearly winning the news boxes. On second position it the BBC with 16.4 percent, on third position The Guardian with 13.7 percent is on third place, a publisher closer to the Remain campaign, but not very strongly holding this position. 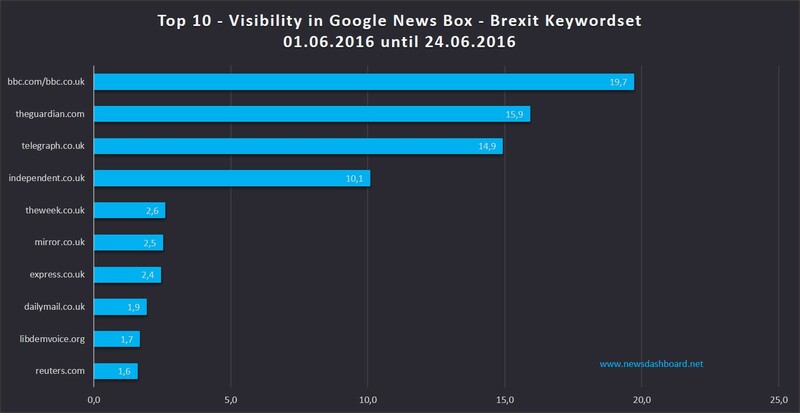 The Telegraph, the BBC, the Guardian and the Independent were leading regarding their visibility in the Google News Boxes. If we look at a longer time interval the BBC and the Guardian were leading – the Telegraph was“just” on third Position. It is obvious that the Telegraph has been most successful in the Google News Boxes in the week before the EU referendum took place. Between 20th and 24th of June the site had a visibility in the Google News Boxes of 23.6 percent, which is very high. If we add the data of the time before and look at the time interval between 1st of June and the day after the referendum, we can see that the Telegraph “just” was on third position with a visibility in the Google News Boxes of 14.9 percent. There the BBC and the Guardian were leading the Google News Boxes. It shows that before the 20th of June the Telegraph did not have such high results in the Google News Boxes. Moreover there are different news publishers at the end of the Top 10. In the last days before the referendum took place, newsletter.co.uk, ft.com, wsj.com, vox.com and conservativehome.com were in the Top 10. In this time interval they had a good visibility in the Google News Boxes. But if we look at our complete data between 1st of June until the 24th, we see that all in all they were not that successful: there express.co.uk, dailymail.co.uk, libdemvoice.org and reuters.com were in the Top 10 instead. 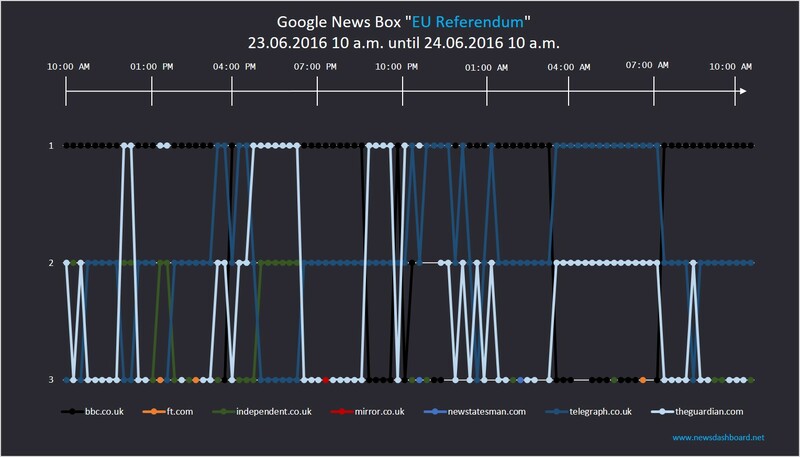 We also picked out two keywords to analyse the Google News Box at the day of the referendum until the next morning. There are some striking differences: If we look at the keyword “Brexit” we can see that the Telegraph dominated the Google News Box the whole day. 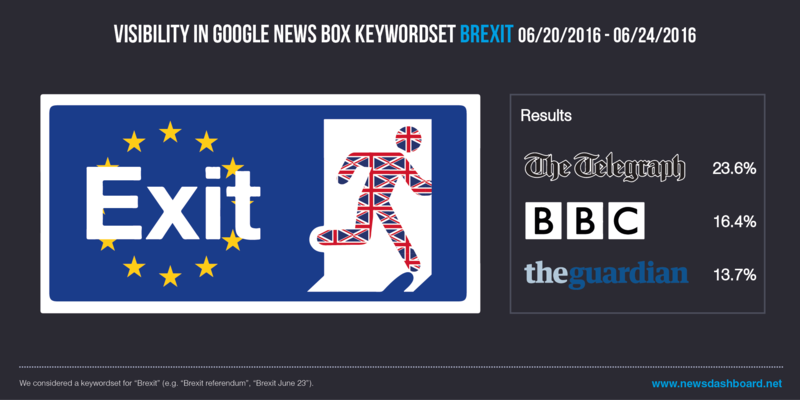 The Telegraph won the Google News Box of the keyword “Brexit”. Almost the whole day articles of the Telegraph were on first position in the News Box. Between 10:00 p.m. and 04:00 a.m. the Telegraph even had a second article in the News Box on position 2. Other news publishers who could get a place in the Google News Box are amongst others the Guardian, the Independent and vox.com. Here we can see a high fluctuation in the Google News Box – there is no clear winner. In this Google News Box there is no clear winner. There are three news publishers which were on first position in the meantime: The BBC, the Guardian and The Telegraph. Those news publishers also share the other positions in the News Box. Other news publishers were only rarely represented. Brexit, Brexit June 23, Brexit poll, Brexit referendum, EU referendum, EU referendum June 23, EU referendum poll, EU referendum polls, EU referendum UK, EU referendum vote, European Union membership referendum, referendum, UK exit, UK exit EU. The Google “in the” News Box is an insertion in the search engine result page (SERP). If you google a specific keyword which is relevant in the news, Google shows up to three news articles in the Google News Box. It is either on first position in the Search Engine Result Page (SERP) (then it is above all other results) or, if the news topic is not that relevant in the eyes of Google or if Google inserts special/own elements, it is further down in the SERP. If someone is interested in reading one of the articles in the Google News Box he just has to click on the specific headline to follow the link to the News Site, which so is able to increase their traffic.